The present invention provides therapeutic formulations for solutions of DELTA9-tetrahydrocannabinol (DELTA9 THC) to be delivered by metered dose inhalers. 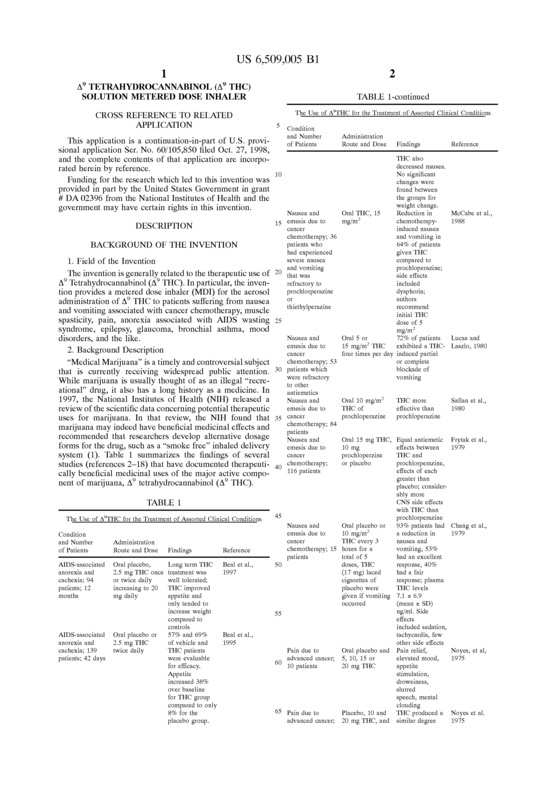 The formulations, which utilize non-CFC propellants, provide a stable aerosol-deliverable source of DELTA9 THC for the treatment of various medical conditions, such as: nausea and vomiting associated with chemotherapy; muscle spasticity; pain; anorexia associated with AIDS wasting syndrome; epilepsy; glaucoma; bronchial asthma; and mood disorders. 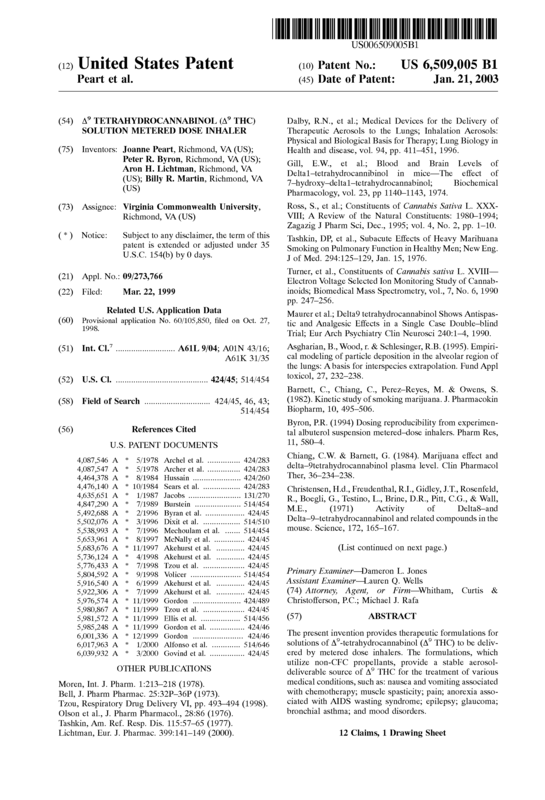 A pharmaceutical composition consisting essentially of 1,1,1,2,3,3,3-heptafluoropropane (HFA 227), Δ 9 -tetrahydrocannabinol, and up to 15 percent by weight of an organic solvent, said Δ 9 -tetrahydrocannabinol and said organic solvent being dissolved in said HFA 227 to form a stable composition, wherein said Δ 9 -tetrahydrocannabinol is present in said composition in concentrations ranging from 0.147% w/w (±0.008) to 5.940% w/w (±0.191). 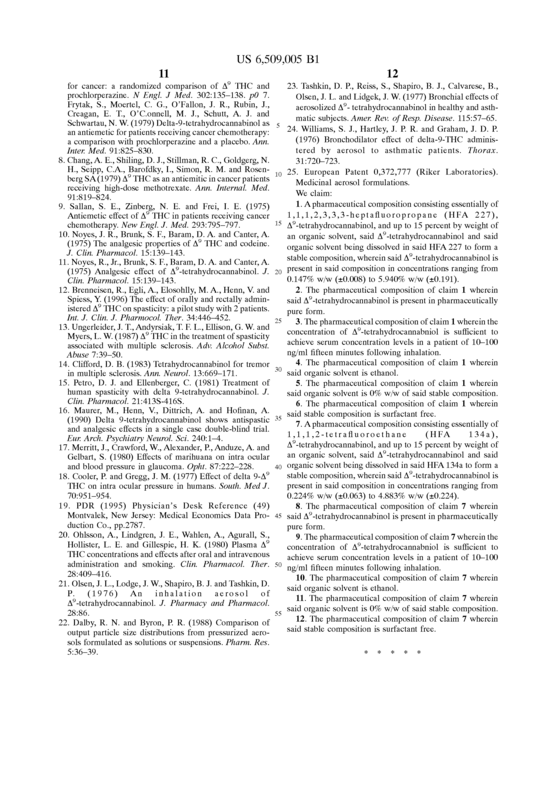 The pharmaceutical composition of claim 1 wherein said Δ 9 -tetrahydrocannabinol is present in pharmaceutically pure form. 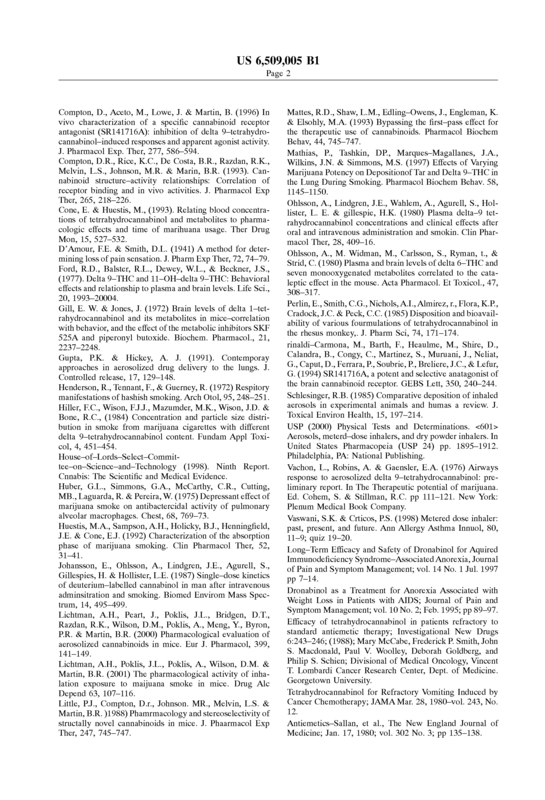 The pharmaceutical composition of claim 1 wherein the concentration of Δ 9 -tetrahydrocannabniol is sufficient to achieve serum concentration levels in a patient of 10-100 ng/ml fifteen minutes following inhalation. 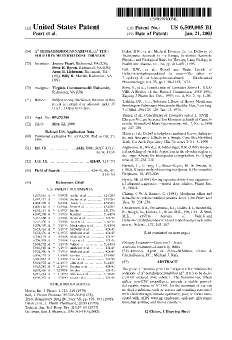 The pharmaceutical composition of claim 1 wherein said organic solvent is ethanol. The pharmaceutical composition of claim 1 wherein said organic solvent is 0% w/w of said stable composition. 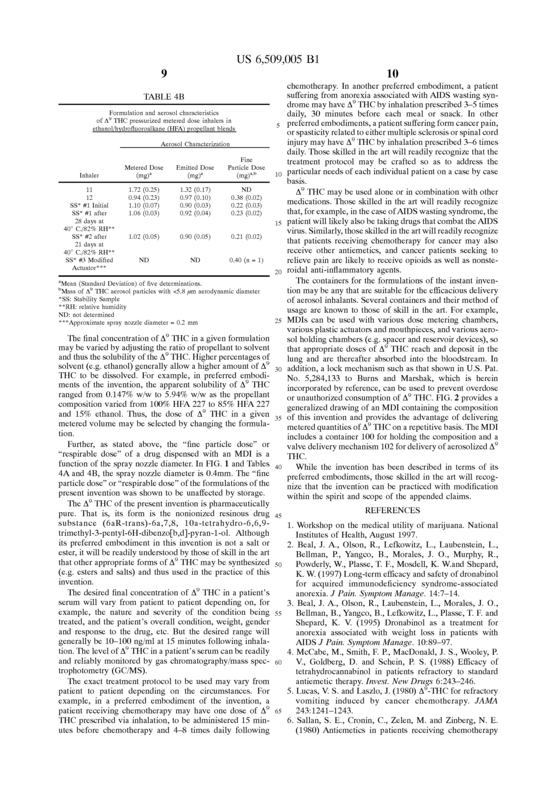 The pharmaceutical composition of claim 1 wherein said stable composition is surfactant free. 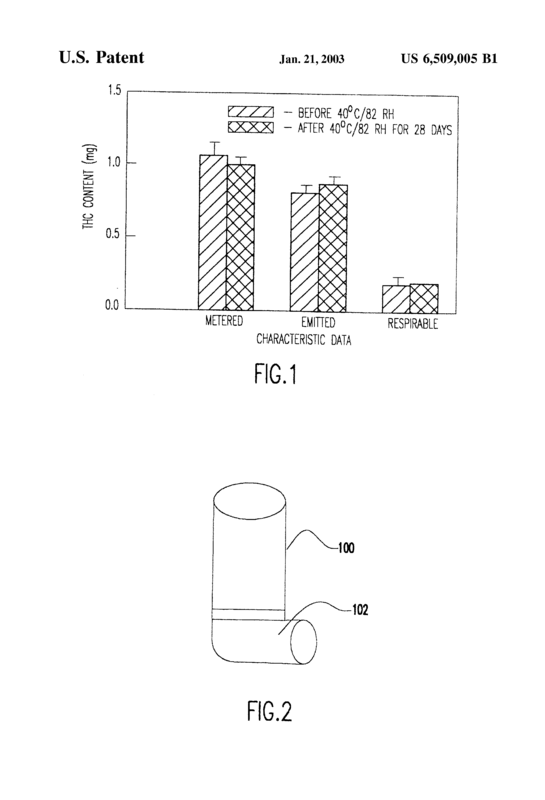 A pharmaceutical composition consisting essentially of 1,1,1,2-tetrafluoroethane (HFA 134a), Δ 9 -tetrahydrocannabinol, and up to 15 percent by weight of an organic solvent, said Δ 9 -tetrahydrocannabinol and said organic solvent being dissolved in said HFA 134a to form a stable composition, wherein said Δ 9 -tetrahydrocannabinol is present in said composition in concentrations ranging from 0.224% w/w (±0.063) to 4.883% w/w (±0.224). 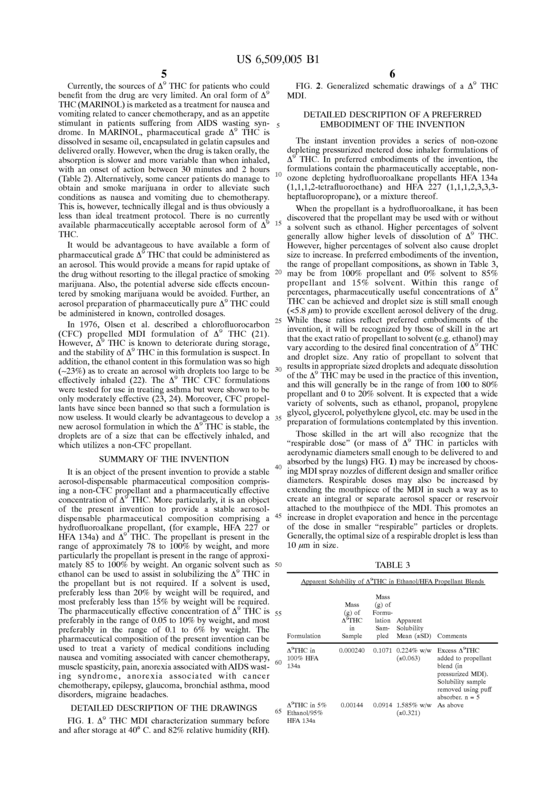 The pharmaceutical composition of claim 7 wherein said Δ 9 -tetrahydrocannabinol is present in pharmaceutically pure form. 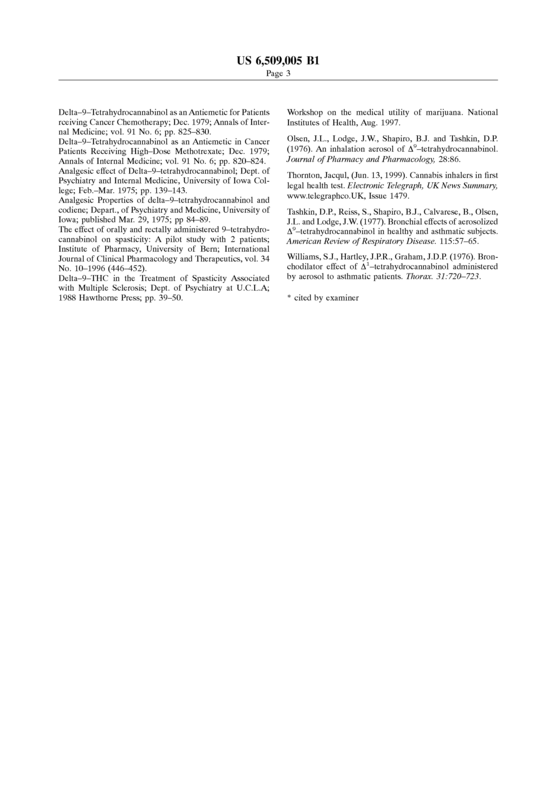 The pharmaceutical composition of claim 7 wherein the concentration of Δ 9 -tetrahydrocannabniol is sufficient to achieve serum concentration levels in a patient of 10-100 ng/ml fifteen minutes following inhalation. 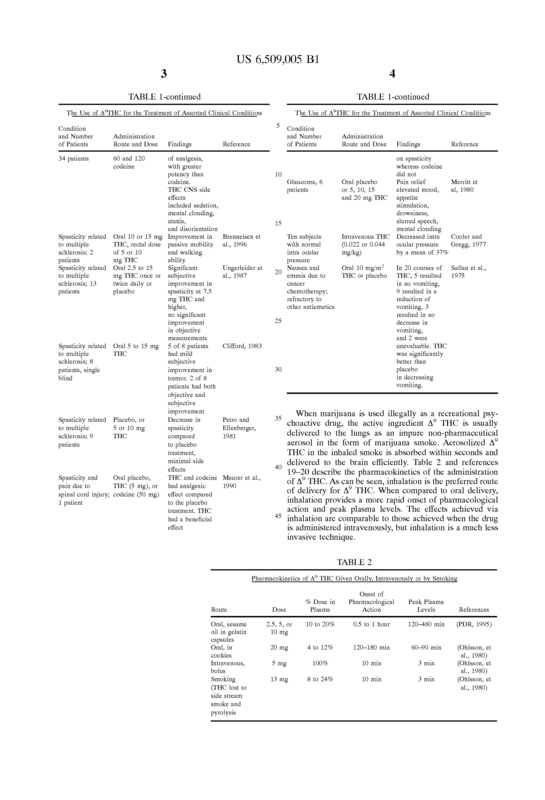 The pharmaceutical composition of claim 7 wherein said organic solvent is ethanol. The pharmaceutical composition of claim 7 wherein said organic solvent is 0% w/w of said stable composition. 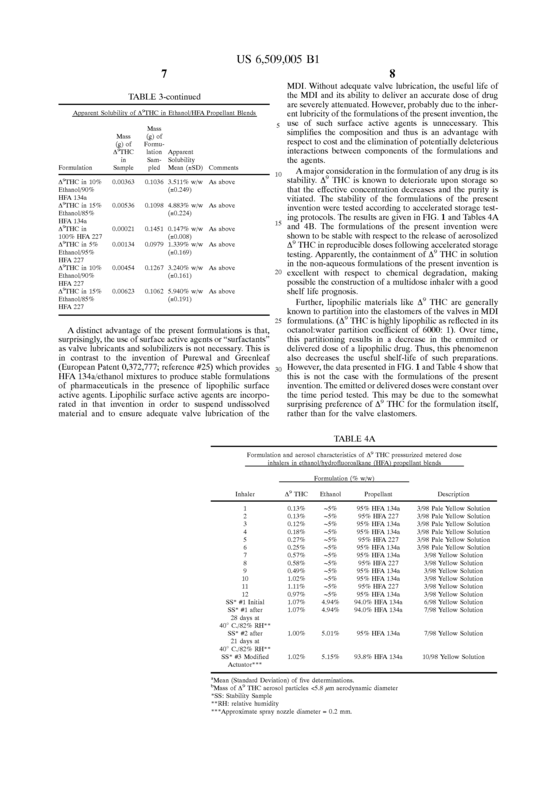 The pharmaceutical composition of claim 7 wherein said stable composition is surfactant free.